AIMS: We describe a monitoring system at population level of patients on antiretroviral therapy (ART) using centrally collected laboratory data. We demonstrate an analogous process of remote sensing using a large set of laboratory results and illustrate the tremendous density of information stored. We moved from an individual to a community view of ART rollout, similar to remote sensing used in the earth and biological sciences when the spatial scale of the investigation is too large to be performed at ground level. METHODS: This was a retrospective cohort study of patients from January 2004 to June 2011. A total of 188 759 individual laboratory results representing 26 445 patients were analysed for average CD4 and viral load by year. RESULTS: The data showed an increasing state of health of the population and allowed for hypothesis generation when the trends did not follow expected paths. CONCLUSION: In this analysis we moved away from individual-centred data to population-level data in order to assess ART programme performance. Routine patient-monitoring data had great utility in assessment of population health. These methods are useful in monitoring and evaluation and effectiveness studies as they are easy to collect, reliable (not requiring much human matching or interventions) and scalable from a single clinic to an entire population. The larger the sample size, the more reliable the results, as confounders (such as incorrectly identified transfers out, lost-to-follow-up patients and transfers in) would be removed. Currently routine laboratory tests are seen as a necessary expense in individual patient care.9 The records are stored in the individual's clinical notes but also, importantly, in centralised databases maintained by clinical laboratory services. The aim of this study was to demonstrate an analogous process of remote sensing by making use of a large, well-collected data set to illustrate the tremendous density of stored information that can be used to gain valuable insights into programme performance and population responses to ARV treatment. This was a retrospective cohort study of patients within a SA nongovernment organisation (NGO)-run clinic system for the period January 2004 to June 2011. Nineteen data sets, representing 17 clinics from 5 of the 9 provinces in SA, were supplied from the Southern African Catholic Bishops' Conference/Catholic Relief Services (SACBC/CRS) ART programme. Using the patient identification number, the first CD4 result for each patient was ascertained, and the time to the following samples was calculated. These values were grouped into 6-month time periods to yield an average CD4 recovery for the study group. Each patient provides one point in each time period (depending on time receiving treatment). The mean CD4 for each patient in each year was determined. The means were then grouped into 100 unit CD4 strata. Each year was represented as a line with the CD4 category along the x-axis and the number of patients on the y-axis. Alternatively the strata were divided into the biologically relevant categories: 0 - 200, 200 - 350, 350 - 500 and >500 CD4 cells/mm3. Each calendar year was plotted as a bar with the proportion of the population in each CD4 category comprising the components. It should be noted that if a patient had been receiving treatment for more than 1 year, their results would appear in each of the years receiving treatment. A summary of the mean CD4 value for each patient in each year, enabling an assessment of total clinic population health, is presented in Figs 2 and 3. In Fig. 2 the area under the curve represents the size of the treated population; health can be assessed by observing where the peak of the curve lies and by noting the bulge in later years which represents patients with CD4 counts >400 cells/mm3. Categorisation of the mean CD4 value for each patient for each year into CD4 strata yielded Fig. 3. This very clearly shows the improvement in population health and thus the effectiveness of ART rollout. The traditional view of the improvement in response to treatment of individual patient viral loads over time is shown in Fig. 1B. We would expect all ART-na'ive patients to have had a viral load >50 copies/ml. The conclusion here is that over the full monitoring period about 25% of patients are transferring into the clinics and are virally suppressed and currently receiving ART treatment. This is significant from a monitoring and evaluation perspective as this overview would be difficult to capture in a clinic setting. In moving away from a patient-centred to a community-centred view it is observed that the population viral suppression rate has increased dramatically over the 7-year study period, with over 60% of the population having an average viral load of <400 copies/ml in 2010 (the last complete year in the analysis). We clearly demonstrated that laboratory data can be used to view a care system from a distance to achieve remote sensing of the population's health. Once data were compiled, a relatively simple analysis gave a very powerful overview of the population level response to ART which is of great importance in the assessment of the impact of public health ART rollout. This is very different to the traditionally held opinion that the patient folder is the primary source of information needed to assess treatment programme efficacy. Minimal change is needed to the existing health infrastructure in order to implement this type of analysis. It can be started immediately and existing historical data allow for comparisons of current clinical systems with those of the past, without having to wait for the accumulation of new indicators. There is a minimal cost as all data are routinely collected; all that is needed is the time required for analysis. With some development, a reporting function can be built into existing databases to generate these results automatically. We report a very 'clean' analysis to show an ideal, well-run clinic situation. Unselected, real-world data are more chaotic but can still be analysed in this way. Not taking the patient's ART start date into account resulted in a larger data set (222 901 records) but gave equivalent aggregate CD4 and viral load curves. These are not shown because the CD4 and viral load recovery trajectories of the complete data are not comparable with the traditional recovery curves (Figs 1A and 1B). The pretreatment laboratory data show an initial decline in CD4 after programme entry, followed by a sharp rise with ART initiation. Mirroring this is a steady increase in viral load followed by a sharp decline. These data cannot be used reliably because of the selection bias in this group with the CD4 threshold and other clinical data governing when the patients initiate ART. Many clinics make use of electronic pharmacy systems10 that could be linked to the laboratory data to give an accurate start date for the analysis. We have performed this analysis on other data sets of different data quality (RW and CM, unpublished data) and have found that the curves seen in Fig. 2 can move 'backwards' with the peak in later sampling years at a lower CD4 value and the proportion of patients in higher CD4 categories becoming less. If the population size is still increasing, this could be attributed to the fact that the clinics are recruiting patients who are sicker, or that existing patients are failing treatment. If the population is decreasing, then the conclusion could be that the clinic is losing healthy patients and retaining or recruiting sick ones. It can be seen that these analyses allow for hypothesis generation that can then be investigated within the clinic or district. In this situation, Fig. 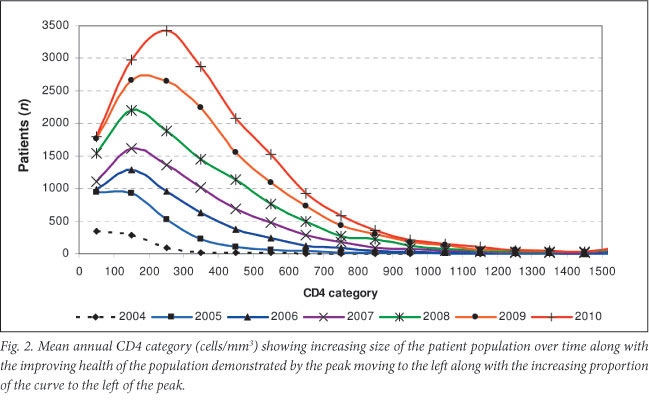 3 would show 'flat' strata with little increase in the proportion of patients in the higher CD4 categories over time. It is not possible to elucidate the individual factors that may be contributing to a poor performance curve (dysfunctional clinic, poor adherence, cultural issues, associated issues such as alcohol or drug abuse, etc. ), but a broad-scale analysis can be made that rapidly identifies areas of concern to which investigations can then be directed. ART programme success relies on its effectiveness. As previously shown,12,13 there is a need to assess the viability, successful implementation and uptake of treatment interventions in the public health setting following demonstration of the efficacy of a treatment in the artificial environment of a clinical trial or pilot study. Using the methods described here, it is possible for direct assessment of the impact of ART on the population at large. It should be kept in mind that only the 'on treatment' population is being monitored,14 but, with increased rollout, the size of the population pool with uncontrolled HIV not having yet entered the ART programme will decrease. Monitoring the progress of a treated population is complex.2 While it is relatively easy to collect data on programme entry from clinic-based records, it becomes very difficult to ascertain programme losses and cycling (multiple transfers in and out of clinics). With the widespread availability of treatment, an outcome of lost-to-follow-up is no longer equivalent to death.17 Transfers among clinics are becoming increasingly common as patients optimise their care strategy;18 this is complicated to monitor at a district level as assessment of an individual clinic's lost-to-follow-up patients may include those 'transferred out' to a nearby clinic but unrecorded, while new patients entering a clinic's programme may be unreported 'transfer ins'.14 By looking at the programme entry viral load, an estimate of transferring in patients can be made and it is interesting that the 25.4% unrecognised transfers rate seen previously18 is similar to the results we have seen based on laboratory records. Furthermore, as this analysis is designed to take a regional view of a programme, provided the scale was large enough (health district level), individual transfers would not influence the population level CD4 and viral load assessments. Indicators of a patient's functional status are often recorded with ambiguity and misclassification.2 Monitoring the CD4 status reveals the population level of health and, by association, predicted functional status. There are moves to redefine indicators to achieve better evaluation of programme and population coverage and of programme quality (e.g. PEPFAR19). Our analysis provides data to assess both of these and we show development of new indicators that offer an overview of programme effectiveness at population level. RW is funded in part by the Cost-Effectiveness ofPreventing AIDS Complications (CEPAC) funded by the National Institutes of Health (NIH, 5R01AI058736-02); International Epidemiologic Database to Evaluate Aids with a grant from the National Institute of Allergy and Infectious Diseases (NIAID: 5U01AI069924-02); USAID Right to Care (CA 674 A 00 08 0000 700) and the South African Centre for Epidemiological Modelling and Analysis (SACEMA).